By His own blood He entered in once into the holy place, having obtained eternal redemption for us. – Hebrew 9:12. The innermost part of the tabernacle in the wilderness, and later the Temple at Jerusalem, was the Holy of Holies, containing the Ark of the Covenant in which was placed the tables of stone upon which the Ten Commandments were written. This Ark of the Covenant was covered with the mercy-seat and the cherubim, between whose extended wings the cloud of God’s presence appeared as a manifestation of His glory and grace. 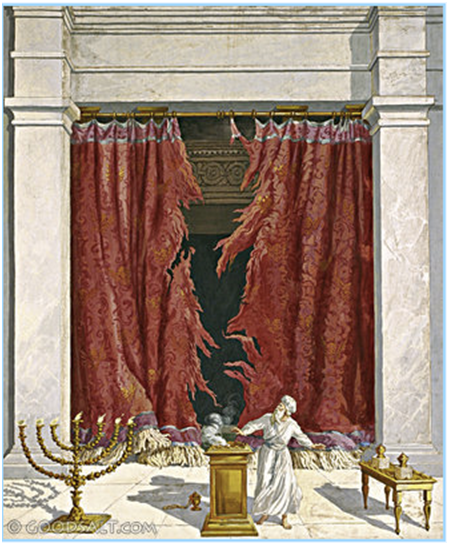 Into this Holy of Holies, which was shut off from view by a thick veil, or curtain, no man dared enter, except the high priest; and he only entered once a year, on the great Day of Atonement, when he brought before the Lord the animal blood that symbolized and pointed forward to the atoning blood of Christ. This was to continue until Christ, the great High Priest, had come and finished His work of atonement. When Jesus died, the great, thick, heavy veil which hung before the Holy of Holies was rent in two from top to bottom by the power of God. And thereby the Lord plainly showed that Christ had now come and had finished His work of atonement, and that Jesus, the Crucified, is this Christ. Yes, Jesus has reconciled us to God; by His own blood He entered in once into the holy place, that is to say, He appeared before God whom we have offended, having obtained eternal salvation for us. And now every sinner can come to God in Jesus’ name and cheerfully say: “Abba, Father!” – And something more happened when Jesus died. The earth quaked, the rocks rent, the graves about Jerusalem were opened, and many bodies of the saints of God that slept arose and came out of their graves; and after His resurrection they went into Jerusalem, and appeared unto many. Through all the miracles attending the death of Jesus, God showed that the Messiah, the Christ, had now come and had finished His work of atonement and eternal redemption, and that Jesus, the Crucified, is that Christ. The earth, this great burying-ground, shall no longer be able to retain us. We who believe in Jesus shall rise, and see one another, and be reunited with one another. And even this old earth, which God had cursed because of sin, shall be destroyed and replaced with a new heavenly one. The Apostle John wrote of this vision: “I saw a new heaven and a new earth; for the first heaven and the first earth were passed away” (Revelation 21:1). PRAYER. – My Lord and Savior Jesus Christ, true High Priest, Lamb of God that takest away the sin of the world, I thank Thee that Thou hast come, and by Thine all-atoning blood did once appear before God, and did obtain eternal salvation for us. I thank Thee that Thou didst rend the veil of guilt which separated me from God. I thank Thee that in Thy name I may come unto God and may call Him Father. I thank Thee that Thou hast procured for me the resurrection from the dead and eternal bliss in heaven. Keep me in true faith, my Lord and Savior! Amen.